A unique election awareness drive was initiated by a few youngsters in Bangalore, urging fellow colleagues to use their right to vote. 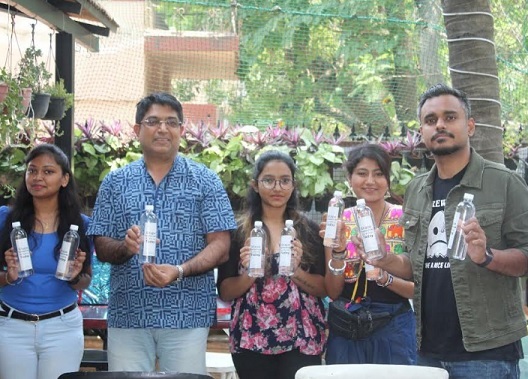 The drive, in which water bottles with a message ‘Vote Today Shape Tomorrow’ were distributed for free, was sponsored by a popular concept cafe in Kormangala - Roundup Cafe. The Additional Director General of Police, Bhaskar Rao inaugurated the drive as the Chief guest. He shared his experiences related to elections with youngsters and social activists present at the venue in a warm and jovial manner. Underlining the importance of every single vote, he mentioned how he had once witnessed a candidate who won with the difference of only one vote. He inspired the youth to exercise their right to vote in the upcoming Lok Sabha elections. Mr. Ram Nivas, Bengaluru Rural SP also joined the event and urged students and young professionals living away from their hometown to travel to their respective constituencies and vote. A young and dynamic tech-driven officer, he is currently working on an innovative app to coordinate voting effectively at all polling booths. The owner of Roundup Cafe mentioned how popular the place is among college students, freelancers and IT company employees - people who rarely turn up to vote, and how events like these at such places can motivate them to vote in their own interests. He emphasised how important it is to gain their attention, spread awareness and generate interest at a place where they spend their time daily, spurring conversations around politics and the most important issues that the country is facing in the present scenario. The Cafe, which also houses premium facilities like a Netflix Movie Theater and luxury homestay, has committed to spread the message to its customers in the next 10 days. The workers have also agreed to distribute 10,000 free water bottles in the nearby localities, offices and colleges, carrying the same motivational message. The entire drive is being carried out to encourage participation in the upcoming elections and motivate people to choose their government responsibly. In the last few years, there have been many organisations who have promoted the idea of voting amongst the youth, yielding positive results. Political leaders, veterans and visionaries have welcomed such initiatives and believe that these campaigns will go a long way in instilling a sense of responsibility among the youth for their nation.